December 19, 2004 - 2004's been kind of a slow year at the Hansen's. This past summer I started building a treehouse for K. Lee in the large tree in our backyard. I started it using scrap wood from Peggy's sister Patty's new house. I've had to supplement that with a couple of trips to Lowe's for lumber and nails. The floor and wall frames are done but work on it has pretty much stopped for the winter. Here's a little virtual tour that shows progress on the treehouse so far, and what is left to do. October 12, 2003 - This past July we visited Santa Fe New Mexico and Estes Park Colorado. I've finally got a page with the exciting story of our 2003 summer vacation and some pictures up. July 20, 2003 - On May 8th, another major tornado tore through the center of Moore, Oklahoma almost 4 years to the day, after the killer May 3, 1999 tornado, following an almost identical path. While not as devastating as the May 3rd F5 tornado, this one was still rated as an F4 and did considerable damage. Peggy's sisters were not as fortunate as they were in 1999 as both of them sustained significant damage to their homes. It took us a while to complete the pages, but we now have extensive coverage with pictures of this event starting on this page. 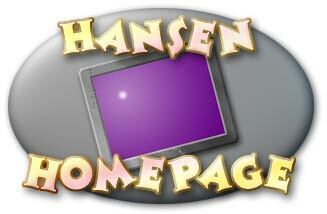 February 8, 2003 - After a year's absence, the Hansen Home Page is back online! We finally have our own domain, and, currently, our own server. All the past items on the Hansen Home Page have been moved to the archive section of the site, and I don't have anything new to post yet. Until something new is posted here, check out out our 1999 vacation to Colorado. Or see our coverage of the May 1999 Oklahoma tornado. You can also read about our daughter Sarah's lovely wedding and the birth of our beautiful granddaughter K Lee. This sight looks best on a 21 inch monitor with 24 bit color, a real fast computer and lots of RAM, but everything does! We try to make sure it looks pretty good on just about any computer though. All graphics on this site were created by RJay Hansen using Adobe Photoshop, Adobe Illustrator, POV Ray and Strata Vision 3D. All site content and graphics Copyright © 2004 RJay Hansen unless otherwise noted. This page was last updated on Sunday, December 19, 2004.